While there is certainly no shortage of fun things to do in Tucson, the usual Saturday family outings and tourist attractions can grow old after time. Plan your next romantic date or kid-friendly adventure with these ideas and dare to venture off the beaten path. When was the last time you and your sweetie drove to a lookout point to marvel at the natural beauty of a southwest landscape? Mt. Lemmon is a fun trip in its own right, from quaint restaurants to gift shops, but save your pennies and pack a picnic basket instead. Plan a personal wine and cheese pairing or simply grab a six-pack of your favorite beer to enjoy while watching the sunset. Speaking of adult beverages, experience a piece of Tucson history by stepping into Buffet Bar & Crock Pot for a pint. Holding the title for Tucson’s oldest pub, Buffet Bar has been serving up stiff cocktails and seedy debauchery since 1934. True to its dive bar character, the tavern opens at 6:00 a.m. and features daily “Happy Minute” specials, free shuffleboard, and 25 cent rounds of pool. The outdoor swap meet is a true gem when it comes to delicious food and eclectic gifts. Cruise by the Tohono O’odham or Tanque Verde swap meets to find a quirky thinking-of-you keepsake for an old friend. Each person in your party can even pick a loved one and compete for the coolest find under five bucks. Note: Tohono O’odham’s weekend bazaar boasts better online reviews than its counterpart—especially if you’re looking for good eats. If you’re up for a mini road trip, visit the Ostrich Farm located in Picacho, about 43 miles outside of Tucson. 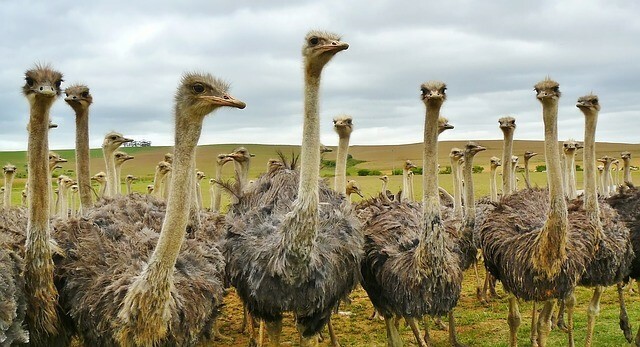 For $7, you can feed the animals and attempt an ostrich selfie or two—that is, if you can contain your laughter long enough. This popular roadside attraction also features a monster truck tour and other animals like lorikeets and miniature goats that are ready to interact up close and personal. If exercise tops your list of fun things to do in Tucson, consider a serene journey though the Coronado National Forest. Rent a bike and pedal down Sabino Canyon or pay for a guided tram tour. Hikers should visit www.sabinocanyon.com prior to each new trail for information such as hiking durations and levels of difficulty along with directions from each tram stop. Just be on the lookout for snakes and tarantulas, often spotted slithering and crawling around their natural habitat. Nothing says romance and charm like an old-fashioned cinema such as The Loft which features independent films, foreign flicks, and the ever-popular Rocky Horror Picture Show. Pair a local brew with popcorn or pizza as you enjoy an outdoor showing of a cult classic or live performance. For more of the latter, check out downtown’s Fox Tucson Theatre. With a map and a $20 bill in your pocket, there’s no excuse for sticking to the same old routine of eating out when there are so many other fun things to do in Tucson. Year round, The Old Pueblo offers tourists and residents alike a plethora of diverse activities, from art galleries to historical tours and all the quirkiness you can handle in between. Nothing bad ever came from having an adventurous spirit, so break away from the norm and you’re likely to have a grand ol’ time.